Declaring that "I think the next President's got to be stronger and smarter than this one," on Tuesday's Imus in the Morning, MSNBC's Chris Matthews went on a tirade for over two minutes against President Bush and those around him who filled his intellectual vacuum. Don Imus pleaded: "Did you plan on taking a breath at any point?" While Matthews had just denounced the ideology of those who filled Bush's empty head with nonsense, he castigated Cheney, the leader of those instilling Bush with their ideology -- at least in the world conceived by Matthews -- for not being more visible: “I don't know what this guy, the Vice President. The Vice President, you know how he hides during difficult times? He's in his bunker, he's in his undisclosed location. Where's Cheney in all this?" The rant from Matthews' matched some of the same points he made last week on the July 18 Tonight Show on NBC (see Noel Sheppard's post), but on Imus he had more time to elaborate and pontificate. 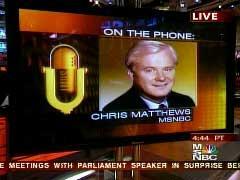 Chris Matthews, by telephone: “It’s all ideology with this crowd. All they care about is ideology. The President bought it hook, line and sinker. It was just put into his head sometime after 9/11. And his philosophy is what was given to him. He didn’t have any philosophy when he went in and they handed it to him. The guys you used to make fun of at school, pencil-necks, intellectuals, the guys you never trusted. All of a sudden, he trusts the intellectuals, the guys he knew at school. You know, they’re a bunch of pencil-necks and now he buys completely their ideology because he didn’t have one of his own coming in. That was his problem. I don’t know what Bush stood for except 'I’m a cool guy and Gore isn’t.’ And that was our problem. We elected a guy because he was a little cooler than the other guy and I hope the next election isn’t a problem of who goes to bed with their wife at 9:30 at night or who knows how to tell a joke on a stage, but it's who has the sense of strength that comes from having read books most of their life, tried to understand history. “Every mistake we’re making in the Middle East right now was made years and years ago by the British, by the French. The mistakes we made in Vietnam were made by the French before. In Algeria the French made all the mistakes we’re making now. If you engaged in an invasion, you will face resistance from the local people based upon religion and nationalism. You will then have to put down that insurgency and you’re going to have to use cruelty and torture to get information because it’s the only way to get intel in a counter-insurgency. Every single thing that’s happened in Iraq was predicted by history. It’s a standard pattern. Ten, twenty years from now when kids are reading this in high school, they’re going to say why are the Americans so dumb? They made the same mistakes all the Europeans had made before. Matthews: “That’s the problem. I think the next President’s got to be stronger and smarter than this one. And I think, I don’t know who it’s going to be but every election we have in this country, we try to serve the current problems. Well with Clinton it was Monica, so we brought in a guy who went to bed with his wife at 9:30 every night and who is kind of regular. And the time before that we picked Clinton because we wanted to focus on domestic and George Bush senior was focusing on a new world order or Jimmy Carter was weak so we brought in Reagan or we brought in Jimmy Carter because he was clean after Nixon and Ford. We’re always trying to solve the current problem. We’ve got to step back and say well, what’s the bigger picture? What do we need as a President? And part of it is the President, he has a better response time, he doesn’t come into these issues 3, 4 days late like Bush does. He’s somewhere in the back or on his ranch, God knows where he is when Katrina hits or 9/11 even. He was off somewhere.